The experience of economic crisis in Europe, from 2008 onwards, witnessed a concerted effort to marginalise organised labour, impose greater market discipline, and further a neoliberal agenda. Whilst many of these efforts were aided by the process and institutions of European integration, thereby consolidating the neoliberal governing strategy which had been adopted from the late-1970s onwards, this also prompted the emergence of newly disruptive subjectivities, strategies and actions. It is this process of reinvention, therefore, that we seek to explore in our research into resistance in the workplace. Following 2008, European workers came under considerable assault, especially in the most crisis-stricken countries of the European south. Banks and financial institutions were saved ‘at the expense of ordinary people’s living standard, welfare, and jobs’. Trade unions were weakened by rising unemployment and an increase in precarious employment. The EU’s policy responses acted to reduce wages and employment in the public sector by imposing austerity measures (for instance, with the Euro Plus Pact, the so-called Six Pack and the Fiscal Compact). Recommendations by the European Commission in the context of the European semester, the Memoranda of Understanding of peripheral countries with the Troika, and policy papers of the DG ECOFIN of the European Commission and the ECB each included explicit demands to limit wage increases and/or make it easier to hire-and-fire. The use of short-term employment contracts was increased. Welfare measures were made more punitive and more conditional on proving a willingness to work. The tax burden also shifted further from capital to labour, especially through Value Added Tax (VAT). The role of trade unions within both firms and policymaking circles was substantially reduced. Coordinated transnational trade union action in response to these attacks were largely, but not entirely, absent. The most far reaching attempt to produce a coordinated transnational response was a European general strike which took place on 14 November 2012, although the strike action remained limited to peripheral countries of the European south, while in most countries action was limited to a day of symbolic protests. At the national level, established trade unions were relatively ineffective in their response, prompting new ‘non-standard’ labour-related strategies, including for instance incidents of boss-napping in France, workplace occupations, and riots that highlighted the inability of official trade unions to represent the voices or demands of workers. The frequency of protest also increased, especially (but not only) in southern Europe. During this crisis period perhaps the most striking example of labour challenging the assault on workers could be witnessed with the new social movements such as 15-M in Spain or the occupation of the Syntagma square in Greece. These movements are rarely discussed in academic debates in terms of them being part of national labour movements, and indeed are more commonly considered to be removed from both trade unions and workplace issues. Yet, these forms of public square occupation-style protests were nevertheless routinely informed by the individual experiences of the participants, many of whom were precariously employed workers in the context of austerity. In this sense, movements such as that of the 15-M represent a transformation of individual experience of workplace grievances into collective demands. From this perspective, the new movements developed a radical-democratic repertoire of action that successfully activated and politicised parts of labour employed in precarious conditions. Resistance to austerity and its effects on labour were also articulated in the European core, for instance witnessing the Blockupy protests in Germany, which were conducted mainly by left-wing activists and a limited range of trade union sections and individual trade unionists (Mullis et al., 2016). As such, Blockupy highlighted, ‘how traditions of autonomous organizing which has shaped place-based left political cultures in cities such as Frankfurt, and related groups such as the FelS collective in Berlin, have shaped the terms of opposition to austerity in generative ways’ (Featherstone, 2015: 26). Rather than a defeat of labour, we argue, the European crisis is characterised by struggles to shift and reinvent labour strategies due to a change in the political and economic context that hampers ‘traditional’ trade union strategies. As the ‘official’ trade unions appeared unable to react, new forms of non-standard labour struggles appeared. To uncover these new forms of struggle, however, a qualitative analysis of labour-related social conflict is necessary. This we seek to do in the following, through a discussion of work-related contestation in the UK and Spain during the post-2008 period. The assault on workers in the UK context mainly took the form of a shift towards (involuntary) temporary and fixed-term employment, a decline in real wages, the introduction by the Coalition Government of fees for Employment Tribunal claims, and an increase in the qualifying period that workers needed to be employed in order to be entitled to standard workplace legal rights. Trade unions staged a number of set-piece (usually single day) strikes and protest events, most notably coordinated strike action which took place between multiple trade unions in 2011, and the major demonstration, March for the Alternative, which was held on 26 March 2011. More sustained strike actions could also be observed, although these were much less commonplace. For instance, refuse collectors in Edinburgh took action short of strike for 6 weeks in a pay dispute that eventually escalated into an indefinite strike lasting 10 days before a resolution was reached. Leeds also experienced an all-out strike by refuse collectors, this time lasting 11 weeks before a deal was reached. Similarly, the BA Cabin Crew dispute saw three 5-day strikes take place in quick succession during May and June of 2010 over proposals to reduce the number of staff working on flights, before it dragged on into 2011, when an agreement was finally reached with BA agreeing to a pay rise and a reversal of its controversial disciplining of striking cabin crew workers. 2015 also saw a prolonged strike by National Gallery staff that eventually was resolved in October after negotiations led to a deal on pay and conditions, as well as the reinstatement of one of the sacked trade union reps involved in the dispute. The initial post-2008 period also witnessed a number of unofficial strikes. Perhaps most prominent of these was the Lindsey Oil Refinery dispute of 2009, which (as we see in more detail in the case study below) saw a wave of wildcat strikes during the year, around the claim that labour migration (facilitated by the single European market) was creating downward pressure upon nationally-agreed wages and working conditions. In addition, two key workplace occupations took place in 2009 in two different firms: Visteon and Vestas. We also witnessed groups of workers or professionals turn to strike (or quasi-strike) action despite historically being reluctant to do so. 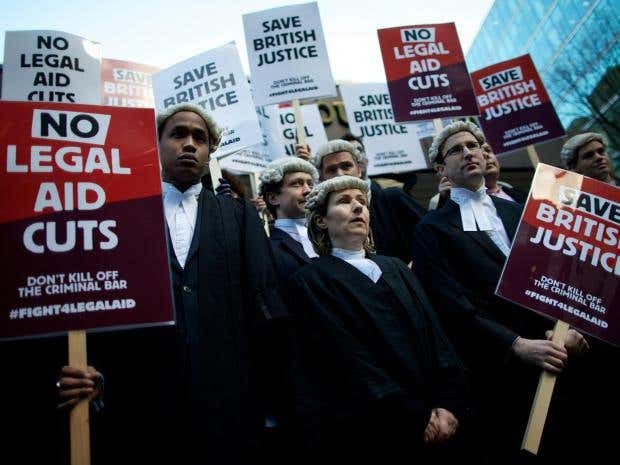 For instance, in 2012 lawyers, solicitors and barristers began a two-year campaign against the proposed reforms to the funding of legal support for defendants (Legal Aid), including demonstrations outside of courts, and the refusal to take on new cases. 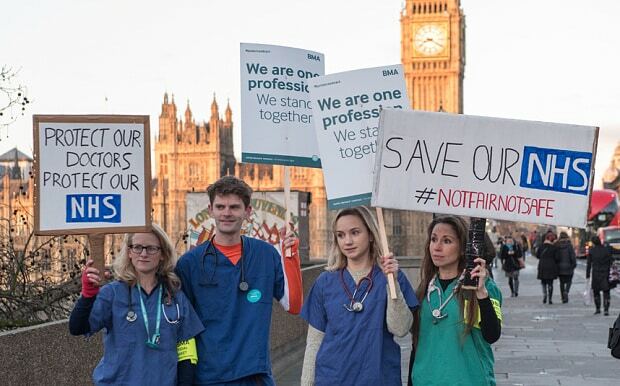 Likewise, one of the most high-profile and difficult disputes for the government was that of the 2015-6 dispute over junior doctors contracts, which saw the junior doctors stage an increasing number of days and intensity of strike action in opposition to what was viewed as an intransigent approach on the part of the government to rewriting the junior doctors’ contracts. Finally, with a rise in the number of precarious, temporary/part-time and so-called ‘zero hours’ jobs we have also a growing trend whereby such workers have managed to organise sustained resistance to their working conditions and wages, despite the notoriously difficult nature of doing so. Thus, care workers working for the firm, Care UK, took part in a 90-day strike over low pay in 2014. Sports Direct saw a campaign largely led by Unite the Union, which focused on publicising working conditions within the retail firm and managed as a result to draw attention to the use of zero hour contracts and low pay. This caused a considerable degree of poor publicity for the firm, focusing especially on its founder, Mike Ashley, and eventually forced the firm to compensate workers who it was found to have systematically paid below the minimum wage. Similarly, 2016 saw a growth in the prominence of small independent trade unions, UVW and IWGB, as they gained considerable media attention for their campaigns around low pay in the so-called gig economy firms, Deliveroo, Uber Eats, and in 2017 in opposition to the retention of tips by restaurants in the major department store, Harrods. As we can see, thereore, the post-2008 context witnessed a combination of both relatively unimaginative (and largely unsuccessful) trade union disputes conducted mainly within the public sector, and a number of more unconventional forms of worker resistance that represented an attempt to reinvent methods of workplace contestation in a national context where official trade union activity has been rendered largely ineffective. This latter process of reinvention, moreover, was particularly conducted by precariously-employed workers or by those disgruntled at the heightened effect of market competition. We turn now to consider three of these cases – the Lindsey Oil Refinery dispute, the Vestas occupation, and the Brixton Living Wage campaign. One of the first major signs of workplace rebellion during the post-2008 period came with the Lindsey Oil Refinery dispute. The dispute began in January 2009 when 800 engineering construction workers staged an impromptu and unofficial wildcat strike in opposition to what was viewed as an attempt by the East Lindsey Oil Refinery (owned by Total) to employ Italian workers – hired through an Italian contractor, IREM, and in accordance with the European Posted Workers Directive – in a deliberate attempt to undermine the negotiated terms and conditions of existing staff. This initial wildcat strike, moreover, was followed almost immediately by between 3000 and 4000 construction workers staging similar strikes at construction project sites across the country (Ince et al., 2015). In February 2009 a deal was eventually reached, under the facilitation of the government agency ACAS, according to which 102 new jobs would be made available for ‘locally sourced’ employees (i.e. ‘British workers’). This resolved the dispute, although in June 2009 the issue sparked further industrial unrest as 51 employees were made redundant, apparently as a direct result of their involvement in the February action. This prompted another wave of walkouts, at Lindsey and other plants across the country. Total initially replied by threatening to sack the 647 staff taking place in the unofficial strike action, although eventually a deal was reached in which no member of staff was sacked (including the original 51) and the workforce returned to work (Barnard 2009). The dispute was about … the threat to jobs. There were hundreds if not thousands of men being summarily dismissed. Cheap labour coming in – European labour we’ll call it, for want of a better word. The influx of cheap, European labour, was decimating the construction industry. They [the employers] wanted their project finished irrespective of the social damage it caused. In order to address these issues, therefore, the workforce resorted to mass unofficial strikes. Indeed, it was this willingness to act beyond the established legal framework and especially outside of the institutions of the trade union that highlights the degree to which this might be considered an act reflecting a more widespread sense of disaffection. Indeed, this extended from a sense that trade unions were unresponsive, to include also a similar critique of both parties and the state. In the words of one of the organisers, ‘the full-time [trade union] officials and the Labour Government at the time – Mandelson and what-have-you – wouldn’t listen to our concerns and complaints’ (interview with LOR strike committee member, 28 May 2014). The LOR dispute marked an important moment in post-2008 industrial relations and the broader context. In particular, it represented a key moment during which it became apparent that a constituency of British workers harboured growing resentment at what they felt were concerted attempts to undermine their working conditions through the free movement of labour associated with European integration. It also marked perhaps the most visible instance of worker dissatisfaction with the implications of free movement of labour; something which would clearly return to the foreground in 2016 with the Brexit referendum. The Vestas occupation also occurred in 2009 and marked a direct response to the threat of being sacked. The target company, Vestas, a Danish wind turbine manufacturer, announced in July 2009 that it would be closing one of its factories located in the Isle of Wight, selected for closure on the grounds that it was no longer profitable. In response, and following a series of meetings held by the workers, several employees decided to stage an occupation of the factory, making two key demands: that job losses be avoided by the firm (or redundancy payments improved), and that the government would provide support for the factory (including potentially through nationalisation) in recognition that it had environmentalist benefit alongside economic value (Gall 2011). In addition to the occupation, a relatively large solidarity camp was formed outside the factory, and a number of supporting rallies and demonstrations were staged throughout the period of the occupation. Further, as a result of the nature of the campaign it managed to combine support from both the workers’ movement and the environmentalist movement. This, combined with significant support from the local community and from those workers who were not taking part in the occupation, meant that the campaign rose to achieve national prominence and considerable support from a broader national labour movement and environmentalist activist community. The strategy of the campaign focused specifically on the use of a disruptive occupation as a means by which to sanction the firm. As one of the solidarity campaigners put it, ‘We reckoned that our chance of success lay in creating a media storm but also in losing Vestas loads and loads of money’ (interview with solidarity demonstration organiser, 26 June 2014). In much the same way as had been witnessed in the dispute over the Lindsey Oil Refinery, moreover, those involved in the Vestas protest showed considerable disaffection and disinterest towards a range of political institutions. As such, the protest represented a welcome opportunity to express a voice, and in a way that might have a better chance of being heard: ‘it was good at the time just to vent our feelings and show that we weren’t just going to disappear. […] We were angry at the company basically’ (interview with Vestas ex-employee and participant in the solidarity protests outside the occupation, November 2015). To a certain extent, the occupation was unsuccessful. The demand for enhanced redundancy pay was not met, and indeed those who staged the occupation had their initial offer of redundancy pay revoked as they were instead dismissed on the grounds of gross misconduct (rather than redundancy) meaning that they received less compensation than they would otherwise have done. Similarly, the ‘demonstration effect’ of the action was minimal, in that no significant additional occupations took place as acts of workplace contention in Britain following the Vestas dispute. This was despite the repeated attempts of a number of left wing groups to prompt such actions (Gall 2011). What the Vestas occupation did achieve, however, was a lesson in how to gain the attention of national media and therefore national politicians. Through the innovative use of occupation as a strategy, and an alliance of employees, environmentalists, labour activists and community groups, the issue of redundancies and government intervention was put firmly on the political agenda. This was sometimes an uneasy coaliltion of constituents, with reports of clashes between environmentalist activists more used to an alternative scene clashing with those of a more workerist bent seeking to avoid alienating the local community and workforce. Likewise, for some of the ex-employees there was a sense that their own protest had been ‘hijacked’ by the arriving full-time activists. Nevertheless, it cannot be denied that the sometimes strained coalition of actors was effective in putting the issue on the national agenda, witnessing considerable media reports of the protest. Further, the strategy of occupying buildings – whilst rarely (if at all) used in subsequent workplace struggles within the UK – did nevertheless go on to become an important element in subsequent campaigns around austerity measures, especially with regard to university tuition fees, welfare cuts (UK Uncut), the attempt to highlight inequality (Occupy movement), and housing struggles. In this sense, the Vestas occupation – and especially those forming the solidarity camp in support of the occupation (many of whom would go on to participate in subsequent anti-austerity struggles) – represented an important opportunity for both lesson-learning and the formation and consolidation of networks of anti-austerity campaigners. At the beginning of 2014 cinema workers employed by Brixton Ritzy Cinema (a branch of Picturehouse) announced that following negotiations between their union (BECTU) and the employer, in which they had been seeking a rise in pay from their then rate of £7.24 to the London Living Wage, which had at that time recently been increased to £8.80, they would be entering into a campaign for a wage rise that would match the Living Wage. In seeking to place pressure on Picturehouse, the campaigning Cinema staff sought immediately to draw attention to the reputation of the firm, and particularly its image as an arthouse and independent cinema, which the workers believed should be matched by a commitment to guard against the low pay and poverty of its employees. As one of the campaign leaflets put it, ‘Recently bought out by Cineworld, the Ritzy is one of the highest grossing Picturehouse cinemas. Pitching themselves as an ethical enterprise, they host the Human Rights Film Festival, sell fair-trade chocolate and support charities, whilst not currently paying a living wage to their staff’ (quoted in Brixton Blog). Having failed to reach an agreement in the ACAS negotiations, however, BECTU announced in March 2014 that it would be balloting its members with a recommendation that they vote to take industrial action (Brixton Blog 2014b). In doing so, moreover, they promoted what would become a highly successful social media campaign in support of the living wage. This revolved around both a twitter and facebook page which rapidly gathered widespread support and a large number of followers (the twitter page currently (January 2017) has over 2,900 followers, and the facebook page has over 6000 ‘likes’). This, combined with the reputation that the cinema had sought to cultivate, of being independent of corporate media and in support of human rights and social justice, compounded the pressure that the living wage dispute was able to place upon the firm. The profile of the dispute gained the attention and support of media celebrities, including Eric Cantona, Ken Loach, and Russell Brand. We were striking for the principle of the living wage, but also to show that people in low paid jobs don’t just need to accept low pay and can campaign for better conditions. This success could also be witnessed with the return to strike activity in a subsequent living wage campaign launched in 2016. This latter campaign (which at the time of writing is ongoing) saw the successful escalation of the dispute, this time to include workers at Crouch End Picturehouse, Picturehouse Hackney and Picturehouse Central (all in London), and with the ballot votes securing a huge yes vote of over 95 percent in the cases of Hackney and Central. Perhaps the most important element contributing to the success of the action was the strong degree of unity that was achieved. This was largely due to the high commitment amongst the workforce to debating and discussing collectively the strategy, and a strong commitment to acting collectively. As with the UK, but with considerably more intensity and visibility, industrial relations in Spain changed significantly during the European crisis. Key elements to this included dramatic increases in unemployment, the urgent need to find an alternative growth model following the collapse of the real estate-led model of growth, a drastic erosion of workers’ and trade union rights, and a decline in trade unions’ ability to achieve influence within the Spanish economy. The European institutions, and especially the mechanisms of crisis management adopted during the crisis, have each functioned as key driving forces during this process. In response to these developments, however, we have also seen a move by both organised and less organised workers to reinvent forms of struggle, including through a combination of (symbolic) general strikes, militant unlimited strikes and forms of social movement unionism and community organising. Despite the PSOE Government announcing further austerity measures in May 2010 (including a 5% cut in salary for all public sector workers), the trade unions argued against the need for a general strike. Instead, a strike of public sector workers was called for 8 June 2010. The same month, the PSOE Government also unilaterally imposed a number of measures designed to increase the degree of flexibilisation of the labour market, including through a reform that would significantly reduce protection from dismissal (Clua-Losada and Ribera-Almandoz 2017). CCOO and UGT did now move to call a general strike, which took place on 29 September 2010. But in doing so trade union leaders explicitly stressed that the strike was not designed to be in opposition to the Zapatero government, but was rather intended to be a ‘wakeup call’ for the PSOE to change its course (Huke 2014). A second general strike to take place on 29 March 2012. This was followed on 14 November 2012 by a further general strike, this time as part of a wider European day of action called by the European Trade Union Confederation (ETUC). Striking workers and trade unions also sought to connect with local communities. The most vivid instances of this tendency were seen with the protests of the striking Asturian miners in 2012, who staged their strike in opposition to cuts in subsidies which in turn threatened their employment. Perhaps the most vivid means by which labour strategies were reinvented during the European crisis in Spain, however, was that seen with the eruption of the 15-M movement. The occupations of public squares in 2011 and the subsequent rise of neighbourhood assemblies and the 15-M as a social movement represented a break in the protest cycle between the old and the new. 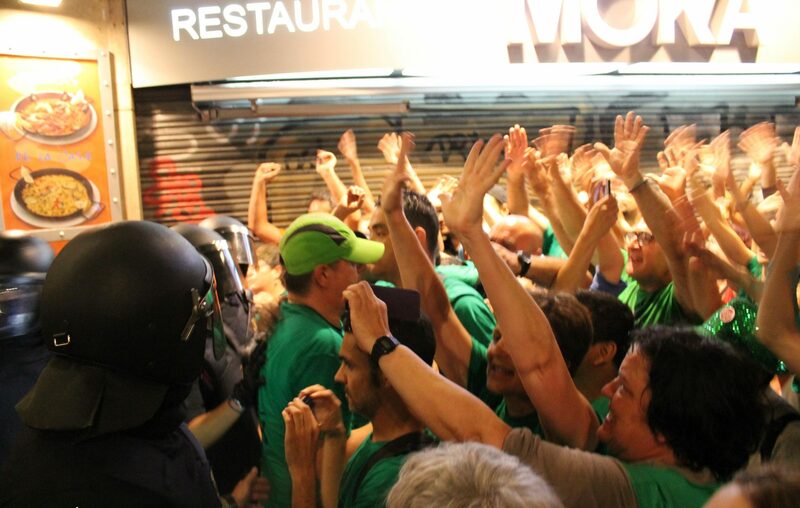 The 15-M assemblies served as nodal points for ongoing protests. The movement produced a rupture with the permissiveness and passiveness that had characterised large parts of the Spanish society in the first years of the crisis (Huke, 2016). The occupations of the squares sparked an intensive process of grassroots community organising in Spain and contributed significantly to the creation or revitalization of neighborhood assemblies as well as thematic working groups and collectives (for instance, in health, education and especially housing). This also acted as a breeding ground for subsequent alternative movements to emerge, including the movement against the privatization of hospitals and health centres in Madrid (marea blanca), protests in the education sector (marea verde), and unconventional forms of radical strike action from below (e.g. Panrico, Coca-Cola, Movistar technicians, teachers strike on the Balearic Islands). The Panrico workers’ strike is the longest lasting strike to have been carried out in Spain since the restoration of democracy after Franco’s dictatorship. In September 2013, Panrico’s new chief executive officer announced a collective redundancy plan that would reduce Panrico’s workforce by 1,900 employees and impose a pay cut of 35 to 45% for remaining staff. The two main unions – CCOO and UGT – staged a strike; this was accompanied by an indefinite strike organised through an unofficial workers’ assembly. The day before the start of the strike CCOO and UGT reached an agreement with Panrico to suspend the strike in exchange for reducing the number of redundancies to 745, with the agreement also including a cut in wages by 18% for the remaining workers. This deal was rejected by the workers’ assembly, witnessing them continue with the action and in addition settling a protest camp outside the manufacturing plant. The uniqueness of this dispute lies not only in its long duration – it lasted eight months – but also in the fact that it developed a complex and multi-targeted strategy that targeted the firm, the official trade unions, and the regional Catalan Government. The strategies of the strikers consisted in multiple combined actions, including both traditional labour movement tactics – such as picket lines, demonstrations and strike funds – and more innovative forms of mobilisation and coordination, such as the use of workers’ assemblies, agitprop and the diffusion of strategies beyond the workplace, and the construction of an external support network. In order to make their struggle known and also to distribute calls for action, the striking workers launched an online social media campaign mainly through Facebook (‘Panrico SOMOS TODOS’) and Twitter (#vagapanrico). In addition, they used other media platforms, such as Youtube, to produce testimony of police brutality, with the latter including attempts to repress the picket lines that the strikers formed at the factory’s entrance and to publicise a documentary developed together with the Lacolumna.cat and titled ‘Panrico, Panpobre’. The Panrico strike also witnessed the sustained use of workers’ assemblies. This was largely in response to what was perceived to be a failure on the part of both public institutions and trade union officials to represent the workers’ interests. Another important aspect of the protest developed by Panrico’s workers was the attempt to unite different strikes and campaigns within a single struggle. One clear example of this was their collaboration with the workers of Coca-Cola’s manufacturing plant in Fuenlabrada, who were also on strike to protest against a redundancy plan and the company’s intention of closing several factories in Spain. 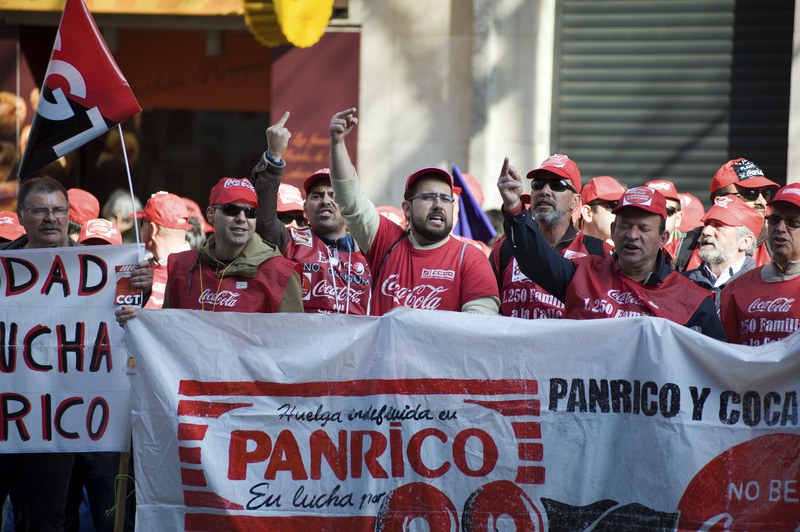 Under the slogan ‘Panrico y Coca-Cola, la lucha es una sola’ (‘Panrico and Coca-Cola, we are in the same fight’), the striking workers of both companies joined forces and demonstrated together multiple times, both in Barcelona and Madrid. Another relevant aspect of the protest is the central role of female workers during the strike. A year after the end of the strike, a group of female strikers continued both to provide support and solidarity to other labour struggles (including the Telefónica/Movistar technicians), and to participate in a variety of events to describe their experiences and the lessons they acquired as a result of their participation in the dispute. These solidarity support networks were fundamental in sustaining the eight-month strike. This unity was maintained, moreover, despite intensive attempts by the company management to erode it. In June 2014, eight months after the strike started, the workers decided in an assembly to reject the offers made by both the firm and the government, and instead to end the strike. In this sense, therefore, the strike was unsuccessful. In terms of the degree to which the Santa Perpètua Panrico workers had managed to disrupt and obstruct the plans of the company, however, the action had been a significant success. Whilst the strike might have ended in 2015, both the struggle of Panrico workers, and the diffusion of the strategies it adopted continue to be ongoing, with the subjectivities and capacity for cooperative action continuing to exist. 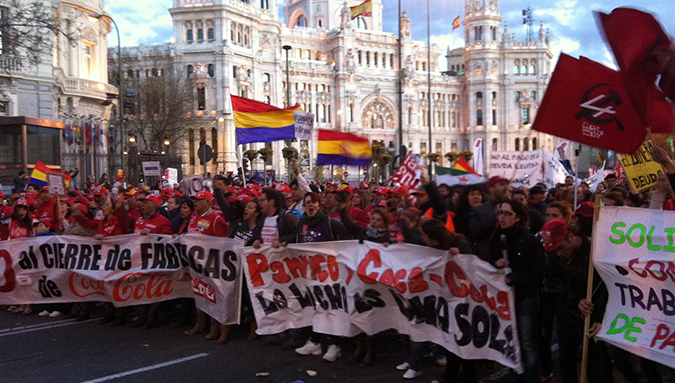 The case of Telefónica represents one of the main examples of autonomous labour struggles during the crisis in Spain. In 1994, Telefónica was one of the most profitable public companies in Spain. It subsequently went through a major restructuring programme which saw the labour force reduced by 60 per cent and a major liberalisation of the hiring model so that most staff were employed outside of negotiated agreements and often as subcontracted workers. These were moves which the main established trade unions considered unchallengeable. In 2015, Telefónica announced the signature of a new contract with the outsourced companies that would produce severe salary cuts for more than 20,000 contracted, subcontracted and self-employed workers. 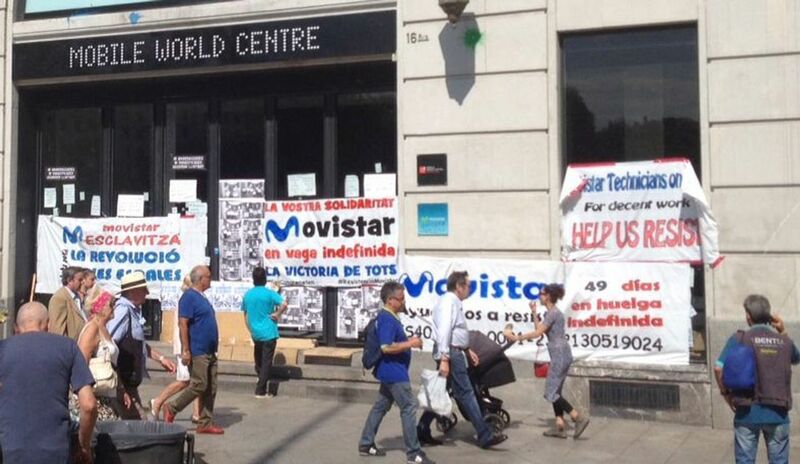 This prompted the Telefónica workers to hold a series of workers’ assemblies, in which they decided to start an indefinite strike in Madrid, rallying around slogans such as ‘They took so much from us that even fear was taken away’ [‘Nos quitaron tanto, tanto, que nos quitaron el miedo’]. This inspired Telefónica workers in other cities to respond in a similar way, and as a result the action was soon replicated in Barcelona, Bilbao, Seville and other Spanish cities. This indefinite strike, the first of its kind organised by self-employed workers in Spanish history, was coordinated by the radical grassroots trade unions CoBas (Sindicato de Comisiones de Base), AST (Alternativa Sindical de Trabajadores) and CGT (Confederación General del Trabajo). The established trade unions, on the other hand, planned a parallel two-day strike action without the support of the workers’ assemblies. This generated among workers a sense of frustration and discomfort with these unions, as well as the perception that they were unable to represent workers’ interests. As a result, slogans such as ‘We fight, we negotiate’ and ‘No, no, no, they don’t represent us’—one of the key mottos of the 15M movement— were directed at CCOO and UGT leaders in different demonstrations performed by the striking workers. 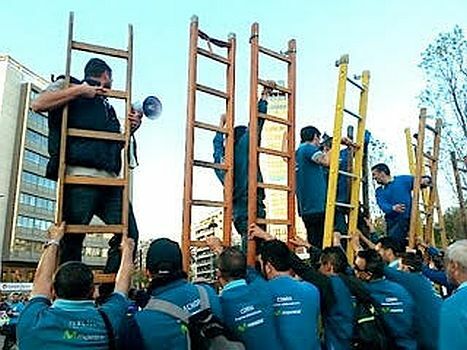 The campaign, known as ‘The Ladders Revolution’ [‘Revolución de las escaleras’], mobilised a large number of workers. Before the European crisis, a high turnover of employees had enabled workers to find the contractors and subcontractors that offered better working conditions. In doing so, these workers built strong networks (often unconsciously) that were ultimately to be used to coordinate the actions during the protest. After two months of strikes, however, an assembly of subcontracted technicians concerned by the lack of media coverage of the campaign and by the growing fatigue of the strikers decided to combine this conventional strike action with other forms of disruptive actions and prefigurative practices. With the support of CoBas, AST and CGT, they decided on direct action and occupied the Telefónica building that houses the headquarters of the Mobile World Centre, a key landmark in the heart of Barcelona. During the occupation, workers distributed informative leaflets to passers-by, organised demonstrations and press conferences inside the occupied building, promoted a strike fund and coordinated different fundraising activities, such as street markets, a communal paella and a music festival. This time, the campaigners were successful in gaining great public and media recognition. The occupation had thus two main objectives. First, it was a means through which workers made their conflict visible, attracted the attention of the media and launched a campaign focused on damaging the reputation of the company’s executives. Their organisational strength, as well as the prefigurative aspects of the protest, were at that time relatively rare within Spanish labour struggles. And, second, taking advantage of the break that the 15M cycle represented, they established an alliance with other social movements, which was also opened up to all those leftist political parties that wanted to participate. A week before local elections were held in Spain, the campaigning workers entered into an agreement with some of the candidates for the mayor of Barcelona, including Ada Colau from Barcelona en Comú, Alfred Bosch from Esquerra Republicana de Catalunya (ERC) and Maria José Lecha from Candidatura d’Unitat Popular (CUP). This agreement, known as ‘The Ladders Pact’ [‘Compromís de les escales’], saw the potential leaders each commit themselves to only contract services from companies that guaranteed fair working conditions, including a maximum of forty working hours per week, two weekly rest days and fair wages. Thanks to coordination with other social movements and political actors, a direct negotiation was forced between the company’s executives and the workers, which for the first time was performed without the mediation of the established trade unions. Telefónica is an example of the direct implications of the 15-M cycle on Spanish workers regarding how resistance and struggle are perceived and coordinated. The 15-M meant a rupture not just with the management of the crisis, but also more importantly with the established channels of political and social representation. Both trade unions as well as Left parties were the focus of vociferous criticism for having failed to provide an adequate response to the crisis. Furthermore, they were identified as also being part of the problem. The perceived lack of union opposition to the 2010 labour reform (approved by the Socialist government) explained earlier in the chapter, despite a general strike, was seen as further evidence of the inability of the established organisations to provide a channel for resistance. The outcome has been an increased level of contention outside and within existing organisations. In response to the post-2008 (European) assault on workers, we have witnessed a range of strategies emerge, in an attempt (with varying degrees of success) to produce alternative means of disruption. This has included the attempt to go beyond formal institutions of trade unions, to find innovative forms of solidarity with groups outside of the workplace, to use the media to highlight and politicise struggles that would otherwise beyond the scope of typical forms of trade union organising, and to use direct action when more conventional means of disruption have proven insufficient. Workers threatened by layoffs and foreclosures have on several occasions outpaced the more formal institutions of trade union in terms of their militancy, developed grassroots structures to pursue their conflicts beyond the strategic confines of the unions, or otherwise seen trade unions cede a much greater degree of autonomy to the union membership than is typically the case. These episodes of contention contributed to the politicisation of the social effects of the economic crisis and an activation of the workforce that made visible – at least temporarily – the fact that radical struggles at the company-level are possible. The combination of these radical forms of action with concrete, proximate demands, have in turn pointed towards a new form of subjectivity, which elsewhere we have labelled pragmatically prefigurative.